Details: A lovely portrait of a great beauty, Lady Louisa Alexandrina Mackenzie, who married Sir Robert Mackenzie in 1846. Sir John Watson Gordon was the most eminent Scottish portrait painter of the mid 19th century. He was a close friend of Raeburn and was influenced by Lawrence and Velasquez. He took over Raeburn’s mantle when he died. He was a prolific exhibitor, with 124 works at the RA and 294 at the RSA. He was elected RA in 1851 and appointed PRSA with a Knighthood and also Limner to The Queen in 1850. Amongst his sitters were Sir Walter Scott, The Duke of Buccleuch, The Prince of Wales, David Roberts and David Cox. Caw describes his style as “simple, sincere, and at his best gravely beautiful”. The description applies well to this portrait. 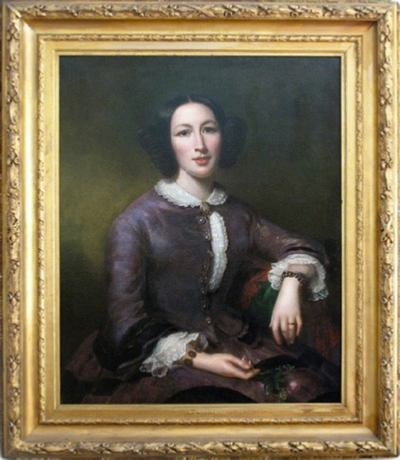 The portrait is of Louise Alexandrina, daughter of Richard Jones, a member of the Legislative Assembly, Sydney, Australia, who married Sir Robert Mackenzie, the 10th baronet, in 1846. It was painted about 1850. Sir John also painted three of her children in the late 1850s – see Witt Library for a photograph of this work. A great beauty, Lady Mackenzie is dressed a befits a member of the upper class in mid Victorian times and as the wife of a Scottish chieftain – her Chieftainess’ bonnet rests on her knee. But a small detail raises an interesting question. A button of her dress is undone at breast level. This is very unusual. Artists are well known for including hidden meanings in their works. Could it perhaps signal a liaison between sitter and artist? An intriguing speculation which certainly adds interest to the work.